For those of us in St. Louis, Gooey Butter Cake and Cookies are everywhere; especially this time of year around the holidays. However, thanks to the genius of the interwebs, Gooey Butter Cake and Gooey Butter Cookies are becoming more well known. The very first post I did on this site was dedicated to a Holiday Baking day with the women in my family (which is an annual tradition that I look forward to every year!). 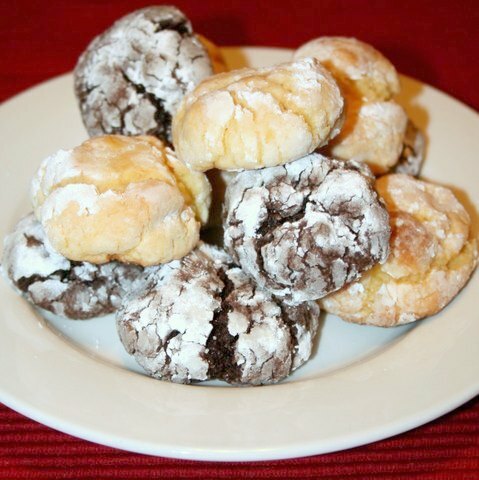 One of the recipes I included was Gooey Butter Cookies, but I have decided to repost the recipe. First of all, I highly doubt anyone will go far enough in to the depth of this blog to find this fantastic recipe, and secondly, I have since starting making these cookies on my own, with different flavor variations that I wanted to share. Third, when reposting I noticed that I missed an ingredient in the original posting, plus it was very bulleted and non conversational. In a large bowl with a mixer, cream together butter and cream cheese until smooth. Beat in the egg, then beat in the extract. Beat in the cake mix. Cover and refrigerate until firm enough to roll (2 hours to overnight if preparing in advance). Preheat oven to 350 degrees. Place powdered sugar in a bowl set to the side. Roll chilled dough in to tablespoon size balls and then in the powdered sugar. Place on an ungreased cookie sheet, 2 inches apart and bake 12 minutes. The cookies will remain soft and gooey. Cool completely and sprinkle with extra powdered sugar if desired. I have made these cookies in the traditional butter flavor, but have started making them in different varieties. I've never heard of them up here, but they sound and look great! Yum, thanks for the recipe! And I love gooey butter cookies and a good chilled glass of wine! Check out list from the experts: http://www.sunset44.com/blog/2010/12/07/just-in-off-wine-spectators-top-100/. Happy Holidays! These were so good!! I made them with a rainbow chip cake mix, and could have eaten the whole batch, my husband tried them and was like wow these are fattening but really good! Thanks for the recipe I will have to for sure make these again!! !